President Moon Jae-in spoke with his U.S. counterpart Donald Trump over the phone on 05 September 2017, a day after the North's latest nuclear test, and they agreed to remove the limit on the payload of South Korean ballistic missiles under the allies' missile guidelines. The two leaders agreed to actively seek countermeasures against North Korea's provocations and fully prepare for potential threats based on the ironclad defense readiness posture of South Korea and the United States. The move is aimed at enhancing Seoul's own defense capabilities against the increasing threats posed by North Korea. Lifting the payload cap from its current 500 kilograms will make it possible for Seoul to develop missiles that can destroy the fortified underground bunkers used by the North Korean leadership. During the call, President Moon also said South Korea will complete the temporary deployment of the THAAD missile defense system as soon as possible. On 23 June 2017 South Korean President Moon Jae-in watched the test-firing of a home-grown missile with a range of 800 kilometers, sending a strong warning to North Korea and its evolving missile provocations. "The president's inspection of the test firing was aimed at sending a clear warning against North Korea's repeated provocations," Park Soo-hyun, a spokesman for the presidential office Cheong Wa Dae, told reporters. "It will be a key component in our kill chain to counter possible North Korean missile attacks," the Cheong Wa Dae spokesman said, adding the new missile was set to be deployed after two more test fires. This test marked the fourth of its kind. It took place at a test site of its state developer, the Agency for Defense Development, in Anheung, located some 200 kilometers southwest of Seoul. "I support dialogue. But dialogue is possible when supported by strong defense capabilities and our engagement policy too will be possible when we have security capabilities that can overwhelm North Korea," the president told ADD officials. "In that sense, I believe the weapons systems ADD is developing are the means to enable dialogue and peace, instead of means to destroy or kill, and so you well deserve to take pride in ensuring our security with the strength of science," he added. South Korea agreed in 2001 to join the "Missile Technogy Control Regime" which limits proliferation of missiles of more than 300km range, 500kg warhead. South Korea repeatedly asked to enhance their own trajectory weapons carrying capacity and range. The US military absolutely did not want to see South Korea have their own independent long-range strike capability. However, South Korea played their own "softly grinding into hard oil and salt" tactics, continuous opening multiple rounds of negotiations and with repeated incidents to the pressure on the US side. Eventually the US side agreed in 2012 to finally compromise, allowing South Korea to increase ballistic missile range from 300km to 800km, in response to the North Korean nuclear threat. At the 300 km range, the warhead carrying load weight was 1.5 tons. On June 3, 2015, South Korea announced the successful shooting range of 500km ballistic missiles, which represents the Korean long-range strike system technology. On 06 April 2017 the Ministry of Defense of the National Defense Science Institute successfully tested the 800km range of ballistic missiles at Chungcheongnam Road, Taian County. The missile launch, flight, and whole process showed good performance to meet the key needs. South Korea planned to experiment with the missile to test its reliability and subsequently deploy the new missile in 2017. If the missile was deployed from the southern coast of Jeju Island in South Korea, far away from the DPRK, the range can cover the whole territory of North Korea. Hyunmoo-IIB was initially deployed with range of 500 km, using inertial guidance at four times the speed of sound. The accuracy on target was 600-1500 meters covering 3-4 football field area. 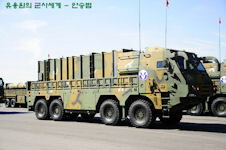 When the South Korean Defense Minister Kim Kuan-chun reported in the Congress "National Defense Medium Term 2013-2017", he said it would arrange about 2.4 trillion won (about 13.6 billion yuan) in the budget for the procurement of 900 Hyunmoo-II series missiles, with the total equipment to reach 1,700 missiles. It is equipped with precision guided bombs, designed for the eradication of 70% of North Korea's ground missiles and long-range artillery within 24 hours after the start of a war in Korea. The Hyunmoo-2A ballistic missiles was reported to have been operational since 2008. The Hyunmoo II ballistic missiles use solid propellant and GPS/INS guidance, enabling it to hit a target at ‘several tens of meters’ accuracy. To compensate for the relatively low accuracy, it is expected the warhead uses cluster munitions. 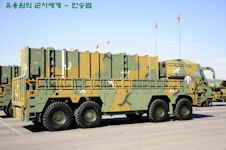 Hyunamoo II has the general shape of the American ATACMS missile [assuming the pictures claiming to be Hyunmoo II are in fact that missile rather than ATACMS]. 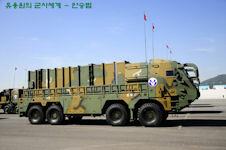 The ready to fire missiles are carried in a trailer-mounted square launcher / container. 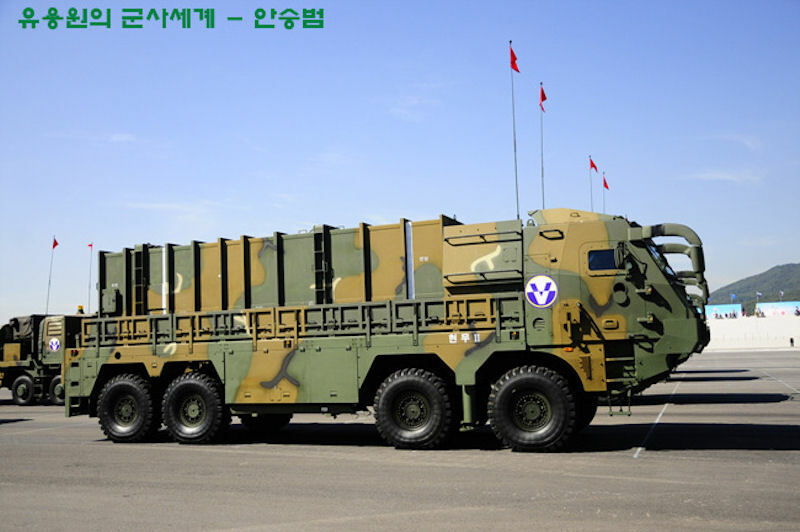 The Hyunmoo-2A ballistic missiles was initially reported to have a range of 300 kilometers. 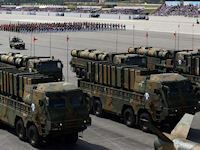 On 1 October 2013, South Korea held a massive military parade mainly to celebrate the 65th anniversary of the founding of its armed forces, but also to deter provocations from North Korea. 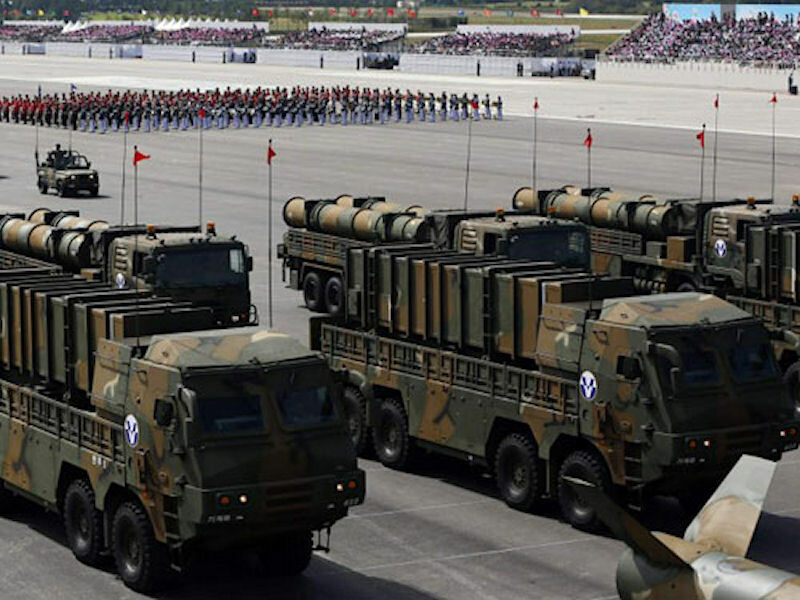 During the parade, South Korea publicly displayed for the first time locally-developed missiles capable of precision strikes in North Korea: the Hyunmu-2B, with a range of 500 kilometers, and the Hyunmu-2C, with a range of 1,000 kilometers. 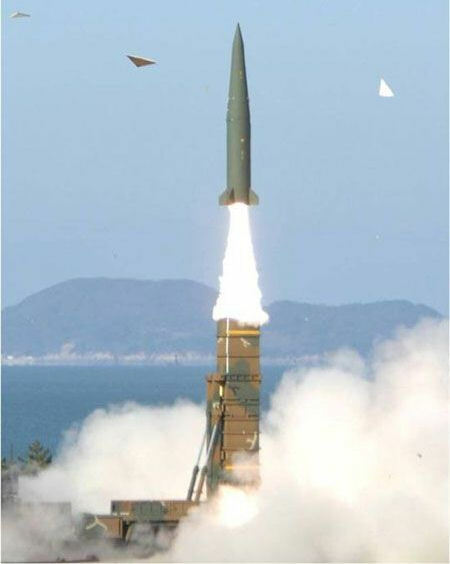 Hyunmoo 2 ballistic missile is a single-stage short-range solid ballistic missile, its length is about 6 meters. The Hyunmoo-II ballistic missile has a completely different size and quality compared to the Hyunmoo-I type ballistic missile, which means that it can not be the result of the Hyunmoo-I missile improvement. South Korea has never independently developed ballistic missiles, so that high-performance short-range ballistic missiles can not be done overnight, can only be the result of the introduction of foreign technology. It is very similar to the DF-11 missile developed by China Aerospace Science and Technology, and the accuracy of the announcement is higher than that of the original DF-11 missile, which is close to the latest model of DF-11 missile. 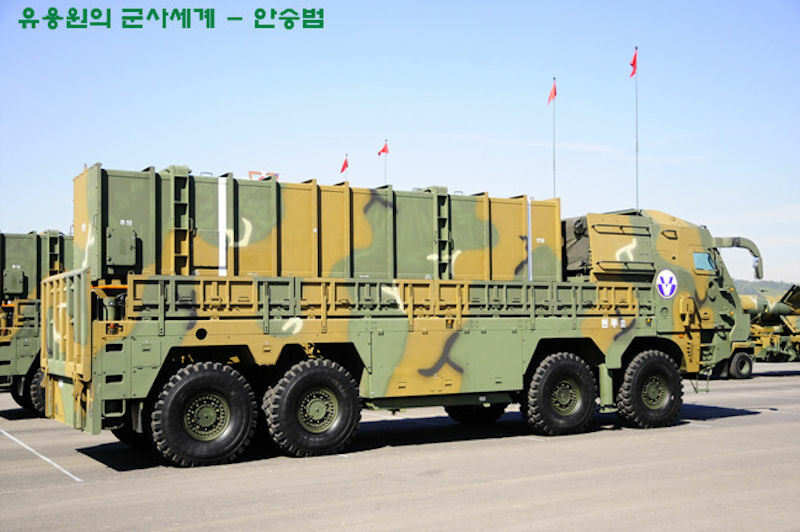 From the Korean military and media published video and pictures, Hyunmoo-II missile head similar to the Russian Iskander missile and China's M20 missile double cone structure, missile shape and Iskander missile is very similar, Even the tail is the Iskander-style truncated delta wing, which shows the missile and the Iskandel missile cut off the blood relationship, a comprehensive judgment that should be the result of the output of the Iskander missile technology. There is precedent for Russia and South Korea cooperation. A South Korea surface-to-air missile system was derived from the Russian medium-range air defense 9M96 missile. The nomenclature for this weapon system is uncertain. Many sources, to include Janes, initially adopted the designation Hyon Mu 3 or NHK-3 for the 300 km ballistic missile, but this seems to have been in error. Other sources maintain that the Hyunmoo III designation references a much longer range ground launched air-breathing cruise missile. The fact of the existence of both missiles is fairly well established, the only point of confusion being the nomenclature associated with each. South Korea aroused American concerns in April 1999 when it test-fired a missile that flew just 50 kilometers off the South Korean west coast. The missile, launched from a newly built test station, was believed to have been capable of flying 10 times as far - but was sent on only a short flight in deference to US concerns. The South Korean Defense Ministry, however, was believed to have stepped up the pace of research and development of the missile even though it has not conducted a new test. In November 1999 it was reported that US spy-satellite photos had revealed that South Korea had built a rocket motor test station in 1998 without notifying the United States. The station, which includes a large concrete or tempered steel cradle in which rocket motors are locked for firing tests, appeared to have been built secretly as part of a larger South Korean ballistic missile program. South Korean officials said privately that Seoul had acquired technology for a longer-range missile from European countries and is developing its "next-generation" missile. The US and ROK governments agreed in principle in November 1999 to extend Seoul's deployment range to 300km, though additional details required clarification in subsequent negotiations. The ROK Defense Ministry requested the ATACMS Block 1A missiles in December 1999, but negotiations the US continued to delay talks on allowing South Korea to deploy missiles with a range of up to 300km. On 17 January 2001 the South Korean government announced it would develop and deploy missiles with a range of up to 187 miles and a payload of up to 1,100 pounds. The South previously had been bound by a 1979 agreement with Washington not to build missiles with a range greater than 112 miles. "By adopting the new guideline, our government will be able to develop and possess missiles with enough range capabilities to meet our security needs," said a Foreign Ministry statement. In an apparent attempt to dispel concerns over a possible arms race on the Korean Peninsula, the government also pledged to join the global Missile Technology Control Regime (MTCR). South Korea is set to join the MTCR at a March 2001 meeting of 32 signers of the treaty. Several sources have suggested that South Korea planned the development of a successor to the NHK-2, the NHK-A. This missile was purported to have a longer range than the NHK-2, perhaps as long as 320 km. Very little information is available in the unclassified literature. In addition, the ROK test launched its first independently developed space launch vehicle, the KSR. While there was initially no information about the KSR in the unclassified literature, one source stated that the KSR could be modified into a ballistic missile with a 900 km range. Unconfirmed reports suggest that a 250 km range version, known as NHK-A, was designed but not developed. A modified NHK-2 or NHK-A was tested in April 1999 and flew 40 km, although it was reported that this missile had the capability to reach a range of 300 km. A Hyon Mu 3 (or NHK-3) version was reported to have a range of 300 km, and in 2009 it was reported that around 100 of these missiles were operational. A report in June 2006 indicated that South Korea planned to retain the Nike-Hercules SAM in service until 2010, which might indicate that the ballistic missile version was operational. South Korean army Major General Shin Won-sik, briefing domestic defense reporters at the ministry on 19 April 2012, announced the South Korean military had deployed a new tactical ballistic missile with a range of 300 kilometers. South Korea was bound by an agreement with the United States to limit its ballistic missiles to a range of 300 kilometers, but slower, surface-skimming cruise weapons are exempt from the agreement. Part of Seoul's pre-emptive strike Kill Chain system, the Hyunmoo-Two-B missile is capable of hitting targets almost anywhere in North Korea. With President Park looking on, on 03 June 2015 South Korea's state-run defense research institute carried out the first test-fire of a ballistic missile with a range of at least five-hundred kilometers. In October 2012, South Korea and the U.S. agreed to extend the South's ballistic missile range from three-hundred to eight-hundred kilometers in the wake of rising nuclear and missile threats from North Korea. Officials in Seoul believe Pyongyang is close to miniaturizing a nuclear warheadand is developing an inter-continental ballistic missile that can reach the U.S. mainland. "When we have a firm security posture and deterrence capabilities, North Korea will have no choice but to stop its provocations and come to the negotiating table. We will be able to bring about change in the North." Along with the Hyunmoo-Two-B, the South Korean military has a 1,000 kilometer-range cruise missile. Both are expected to successfully counter the North's threats on land and at sea. An eight-hundred-kilometer-range ballistic missile in development is near completion. President Park also checked in on South Korea's air and missile defense system, observing a test-launch of the Cheolmae-Two surface-to-air missile. Fired from an off-shore submarine, even a short range SLBM is capable of hitting targets anywhere in North Korea. Korea JoongAng Daily reported 30 May 2016 that the South Korean Military was developing submarine-launched ballistic missiles (SLBMs), according to an un-named high-ranking military official. “On the 3,000-ton Jangbogo-III submarine, which is currently under production, we are installing a vertical launching pad,” said the official, who spoke on the condition of anonymity. SLBMs are fired undersea and are therefore difficult to detect by radar. He added, “The installation of a vertical launching pad indicates that the SLBM is already under development.” The official also went on to say that the SLBM is being developed under the aegis of the Agency of Defense Development and is expected to be completed by 2020. “North Korea, however, is applying the technology of the Russian surface-to-air missile, the S300, to its SLBMs,” Lee Choon-geun, senior researcher at Korean Institue of Science and Technology, told Korea JoongAng Daily. “As far as I know, South Korea uses more stable technology by taking the S400 that was obtained from Russia as a repayment of its debt to South Korea.” The S400 is a technologically superior missile with embedded cold-launching technology. If the development of SLBMs finishes as scheduled, Korea JoongAng Daily reported that South Korean military authorities planed to equip the Jangbogo-III submarine with SLBMs, as this submarine will be turned over to the Navy by 2020. Meanwhile, military authorities decided to upgrade the second version of the Jangbogo-III submarine from 3,000 tons to 3,400 tons. While the South Korean defense official did not name the SLBM system, some observers spetualted that the missile was a variant of the Hyunmoo-2B or its predecessor the Hyunmoo-2A, given that it can be also launched from submarines with vertical launching pads. 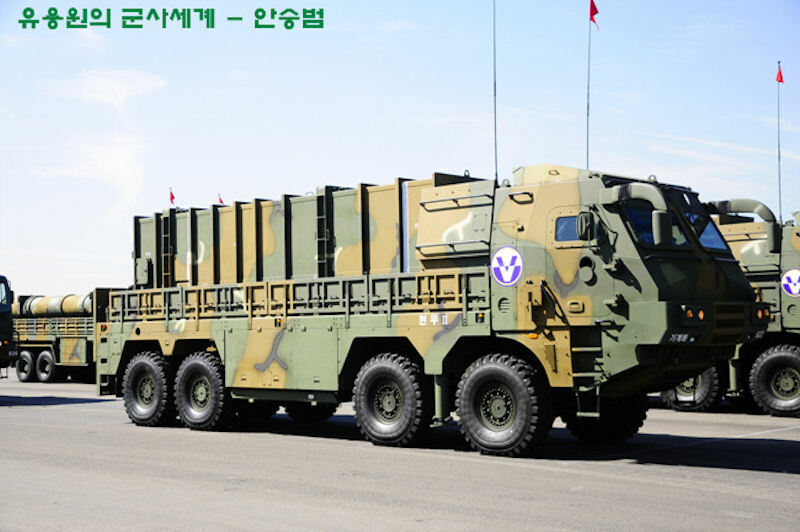 Two Hyunmoo-2B (literally means “Guardian of the Northern Sky”) prototypes were test-fired in June 2015. The ballistic missile purportedly has a range of more than 310 miles and can carry a payload of up to 2,200 pounds (1,000 kilograms). The ROK Navy will receive nine indigenously produced 3,400-ton diesel-electric KSS-III attack submarines, all with air-independent propulsion and a six-cell vertical launching system, from which up to 10 Hyunmoo-3C cruise missiles along with an unknown number of SLBMs can be fired.